Mobile Eyes: Meet the Nokia 6680 Video Phone. The Future Has Arrived. 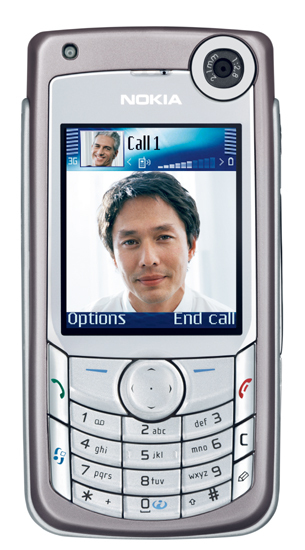 Meet the Nokia 6680 Video Phone. The Future Has Arrived. A good number of people have been awaiting this announcement from Nokia for quite awhile now, and finally they've made it. The Nokia 6680 is official. Mobile Tech says, "Lets hope this phone is the perfect phone the Nokia 6630 promised to be" - but a quick glance at its specs reveals that, like the 6630, it will have only ten MB of RAM. And wasn't disappointment with the 6630 based largely on that same figure for RAM? With a multitude of new phones still to come from Nokia this year, it's likely we'll see one that really blows everybody's socks off. The 6680, while a terrific looking device, is probably not quite it. Still, a real device that allows two-way wireless video calls is right up my alley, and reason enough to be excited. Reminds me of something my son said to me a few years ago. "Dad, do you realize that we're living in the future?" Via Mobitopia.